As Chief Innovation Officer for my company, Onestop Internet, I’m part of a great team of bright people building really amazing and leading edge e-commerce software. And a large part of my role is still being very hands on with our production and development environments, both modifying infrastructure and yes (still, happily) writing code – mostly in C#. When we started the company over 9 years ago, I built our software from the first line of code. Our application stack started then, and still is today built on .NET and SQL Server (and recently, MVC). I’ve always had a Windows machine with 2 displays at my desk. Starting with a machine literally in my garage, then our first warehouse, and as we grew into our 2nd and 3rd warehouses and for the last 4 years, at our multi-building campus in Rancho Dominguez. We recently moved our Marketing and some of our R&D people to our beautiful new suite on the Santa Monica Promenade. After 9+ years of commuting 20+ miles each way on Los Angeles freeways, I’m now riding my bicycle to work along the beach. I switched from an IBM Thinkpad to my first Apple PowerBook laptop in 2004 and haven’t looked back since. For email, web, photography, and music, I’ve always upgraded and used the latest and greatest Mac laptops as my preferred “always with me” computer. For development, always the best Windows machine with lots of speed and memory. My desk has been configured with plugs and connectors waiting for my Mac laptop to be “docked” next to my always-on Windows box and I switched between them throughout the day. When working remotely while home or traveling, I’ve always VPN’d in and connected to my Windows machine via RDP using Microsoft Remote Desktop Connection for Mac, and in the last few years, in a pinch, connected to the Windows machine from iPad, and once or twice, even from iPhone. This has been the way I’ve worked now every single day, for years. That is, until last month, when I powered off my Windows machine for the last time. I am now fully operational, doing everything I need to do in my job using my new MacBook Pro Retina and VMWare Fusion. I traded out my 30″ & 27″ Dell monitors for a single 27″ Thunderbolt display, with HDMI going out to my wall mounted LED display, which is great for meetings and collaborating. 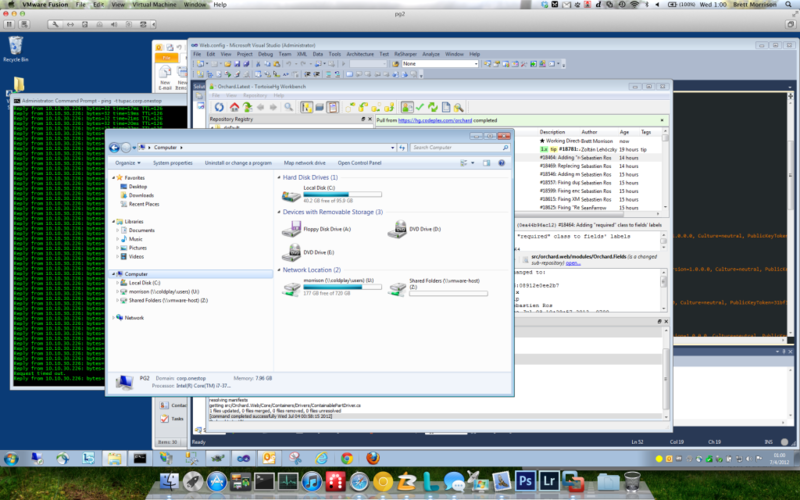 Instead of remoting into my PC at my office, I’m now running a local version of Windows using VMWare Fusion. With our new platform development, we’re using Mercurial and Tortoise HG, enabling completely de-centralized development. After using this setup for a few weeks now, I can’t say enough about how impressed I am with the responsiveness of this setup. The performance I’m getting from this thin powerhouse is amazing. 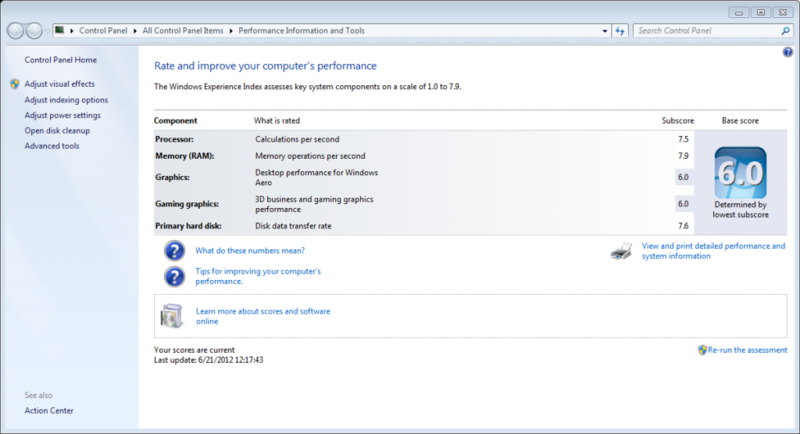 Check out the Windows Experience Index numbers. This is considerably better than what I was getting with my 2 year old, 2 physical processor PC with 32GB of RAM and an SSD boot drive. One word: PHENOMENAL. My MBP Retina is configured with 16GB of RAM and a 512GB SSD. I allocated 4 CPU Cores and 8GB RAM to my VMWare Guest. That’s it. That’s all that’s needed to get this excellent performance. During normal use of file copying, compiling, running IIS locally, SQL queries locally – all the things you do during development, it’s very rare I see the MBP CPU spike and hear the fans kick in. I usually run in windowed mode, but often if I’m doing some heavy PC work, I’ll toggle full screen mode. And if I need to display something on my wall mounted LED, I’ll enable the ‘Use All Displays in Full Screen’ mode. The ‘Unity’ mode is also extremely natural, allowing your Windows programs and Mac OS X programs to run along side each other, seamlessly. Although in my anecdotal experience, Unity seems to cause the CPU usage to increase. Copy/Paste is very natural, and I haven’t had any issues or weirdness copying & pasting between programs in either OS. I don’t need the Guest OS for video games, so I disabled the ‘Accelerate 3D Graphics’ option, and that seems to lower the CPU utilization a bit. USB devices such as the Plantronics Wireless Headset I use for Skyping / Lyncing with our off-site Engineers work well and I can connect and disconnect them to the Guest OS easily. So that’s it. I’m down to one machine for all. 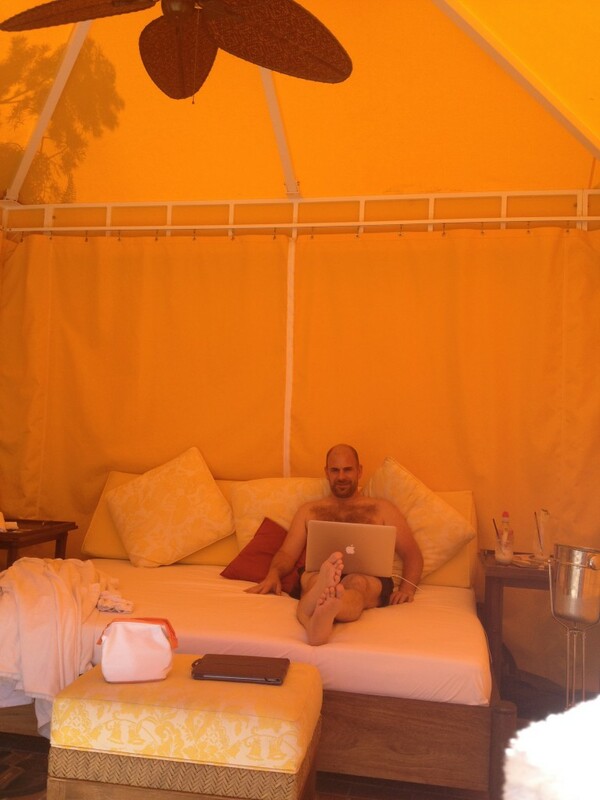 It goes with me wherever I go, and I even used it to code a new distributed caching feature last weekend – poolside. It’s extremely liberating to be able to truly work on a PC on Apple hardware without being tied to the speed of your Internet connection. Remote Desktop Connection served me well over the years, but those days are now officially over. I’m running locally only – and once again, never looking back. Note: That PC I powered off found a home and has since been re-flashed and re-provisioned for a new Engineer at Onestop; May it serve him well! Here I am, a little more hair, a little more blonde, and a bit more girth, giving an on-air demo of one of the first Internet social sharing sites, my company ememories.com. Before Snapfish, Flickr, MySpace, and even Facebook, there was – ememories! Enjoy.